Darjeeling Hill Station is in the State of West Bengal in India and is part of the Lesser Himalayas at an average elevation of more than 2000 meters. 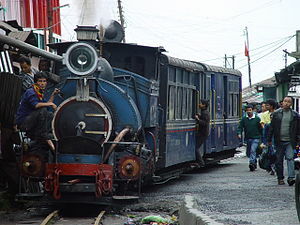 If you are planning to travel in India as a tourist, Darjeeling Hill Station is an ideal destination. This Hill Station was developed by the British during the 19th century, which was part of Sikkim and Nepal those days. Darjeeling Hill Station is famous for the Geo Patented black tea called ‘Darjeeling Tea‘. There were many tea estates those days. Some innovative tea planters tried different fermentation techniques which resulted in a special black tea called Darjeeling Tea. Darjeeling Himalayan Railway along with Nilgiri Mountain Railway NMR and Kalka Shimla Railway is called the “Mountain Railways of India”. These 3 railways networks together forms a single UNESCO World Heritage Site spread across 3 different regions of India. The railway system uses 60 cm wide narrow gauge tracks and this line were opened on 4th April, 1881. The Darjeeling Himalayan Railway has some of the steepest tracks in the world. It climbs from 400 feet at Silguri to 7,407 feet (or 2258 m) at Ghum or Ghoom, which is India’s highest railway station. From Ghum, Darjeeling Himalayan Railway descends about 182.9 meters or about 1,000 feet on its way to Darjeeling. Ghum is at a distance of 6 kilometers from Darjeeling. Ghum Monastery, a Tibetan Buddhist monastery , was established in Ghum 1875. The Hill Station is rich in flora and fauna, being part of Himalayan mountain ranges. How Do I Go to Darjeeling Hill Station? ‘New Jalpaiguri’ railway station connects the down town with the hill station, by the Darjeeling mountain railway. Darjeeling Hill Station is accessible by National Highway No. 55 from Silguri which is 50 plus kilometers away. During Monsoon season, Road and Railway services may get disrupted due to heavy landslides. Bagdogra Airport is the nearest one at 90 kilometers away. Kolkata international airport is at around 700 kilometers away while Patna Airport is at 500 kilmeters away. There is also a rope way connecting the hill station with the bottom town.